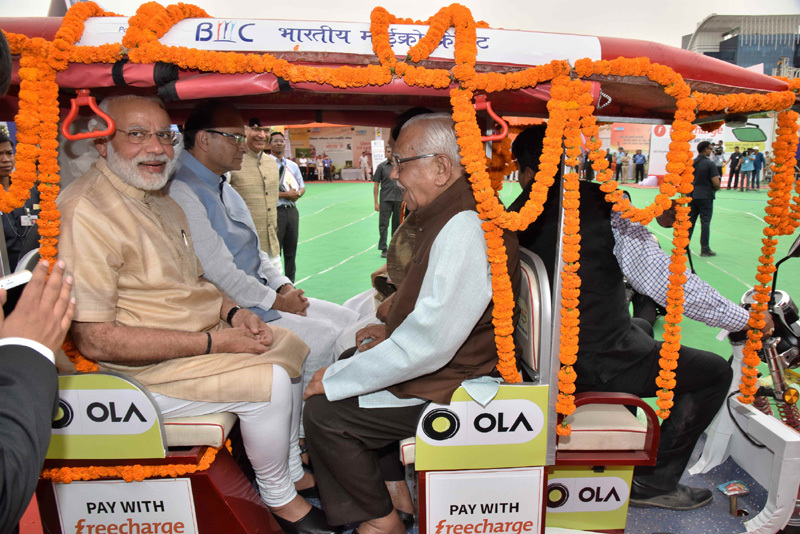 The Hon’ble Prime Minister Shri Narendra Modi rides an e-Rickshaw to promote Stand up India programme, in NOIDA, Uttar Pradesh on April 05, 2016. The Prime Minister, Shri Narendra Modi, today launched the Stand Up India initiative, which aims to boost entrepreneurship among the Scheduled Castes, Scheduled Tribes, and Women. The initiative envisages loans to at least two aspiring entrepreneurs from these categories. The loan shall be in the ten lakh to one crore rupee range. 5100 e-rickshaws were also distributed on the occasion and the PM himself did not hesitate to take an e-Rickshaw ride!